By Ben Bellows on October 6, 2016 | Comments Off on Will 1 Million Digital Devices in 22,000 Primary Schools Create a Unified Education Solution for Kenya? Core digital infrastructure that solves basic problems to benefit a wide range of projects and actors. This educational solution stack is emerging through cooperation across public and private sectors, between teachers and students, content developers and buyers, aimed at long-term sustainable impact… and a lot of learning along the way. 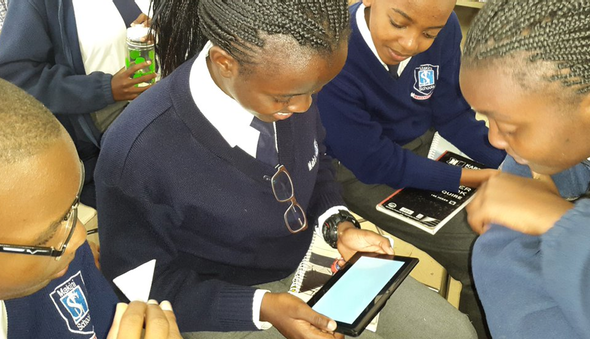 Kenya’s ambitious Digischool initiative is gearing up to distribute 1,200,000 tablets and laptops to students in all 22,000 public primary schools over the next six months. Its success will ultimately depend on how ready the ecosystem is to harness this massive investment. There was general agreement around the table that technology won’t improve education in Kenya without involvement of teachers. “Pull” from communities — whether in Turkana (remote), Kibera (slum), or Kilimani (State House) — is needed. If you want to go fast, go alone; if you want to go far, go together says the African proverb. Community ownership will play a critical role in adoption of new pedagogy. And more broadly, network providers, developers, publishers, government bodies at local and national levels, all have critical roles in ensuring that students and teachers are empowered to be digital citizens. Andrew Karlyn from USAID’s Global Development Lab led off the discussion, focusing on Public Good and asking is there an emerging digital “solution stack” for education in Kenya, similar to the India Stack built on Aadhaar that promises an ecosystem of apps and services for India. Andrew pointed to the Principles for Digital Development, emphasizing designing with the user, open standards, open source software, open data, and collaboration. He also called out sustainability, challenging the group to build on open, public infrastructure. Moses Mutuku of Eneza Education picked up on the theme of Public Good. He shared the story of Eneza’s beginning, inspired by a Kenyan girl who didn’t make it to high school because the only educational material she had was the teacher. The gap Eneza targets is quality content, in particular for use outside the classroom to complement class-based learning. Will Clurman of eKitabu talked about the urgency for collaborative action to grow the ecosystem as the Kenyan government moves quickly to implement Digischool. With 7 other organizations from Kenya, USA and UK, eKitabu formed the Digital Literacy Trust — and more members are welcome! DLT is a public-private partnership to develop the digital ecosystem in Kenya through cooperation with government, NGO, and private sector players. This model can make the difference between repeating well-documented “hardware as innovation” failures of the past (cf. olpc) and creatively opening up new space for digital literacy to take root in Kenyan education. Done well, this approach can also serve as a model for other countries now considering strategies to inclusively foster digital literacy, and globally to achieve UN SDG #4: ensure inclusive and quality education for all and promote lifelong learning. And broad participation and ownership by the tech community in Kenya to achieve sustainability.